Business card maker software is helpful for designing business cards as per business cards labeling needs. Business cards design utility creates business cards for satisfying the needs of business users. 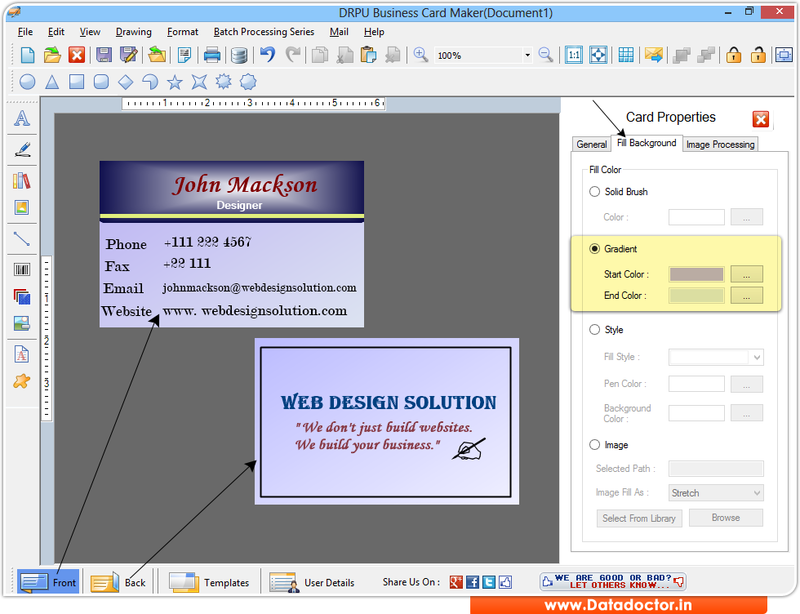 Business card making software facilitates users to design business card with use of image designing objects including Line, Ellipse, Pencil, Rectangle, Text, Arc, Star, Triangle, Picture, WordArt objects. Business cards can be designed and created using card designing software with added feature including Photo, Company logo and barcode. Software is a complete solution for all of your business cards designing and printing needs. » Software easily design new card and edit existing cards. » Create business card with blank or with wizard format. » Enables user to add photos, backgrounds and text during the card designing process. » Allows user to design multiple business cards concurrently using inbuilt Batch Processing Series feature.